As a mother, I always worry if what I'm feeding my daughter is healthy, especially when I'm going out of the house. It's often difficult to bring homemade baby food and snacks when you're out and about, so it's unavoidable to opt for packaged baby snacks from time to time. 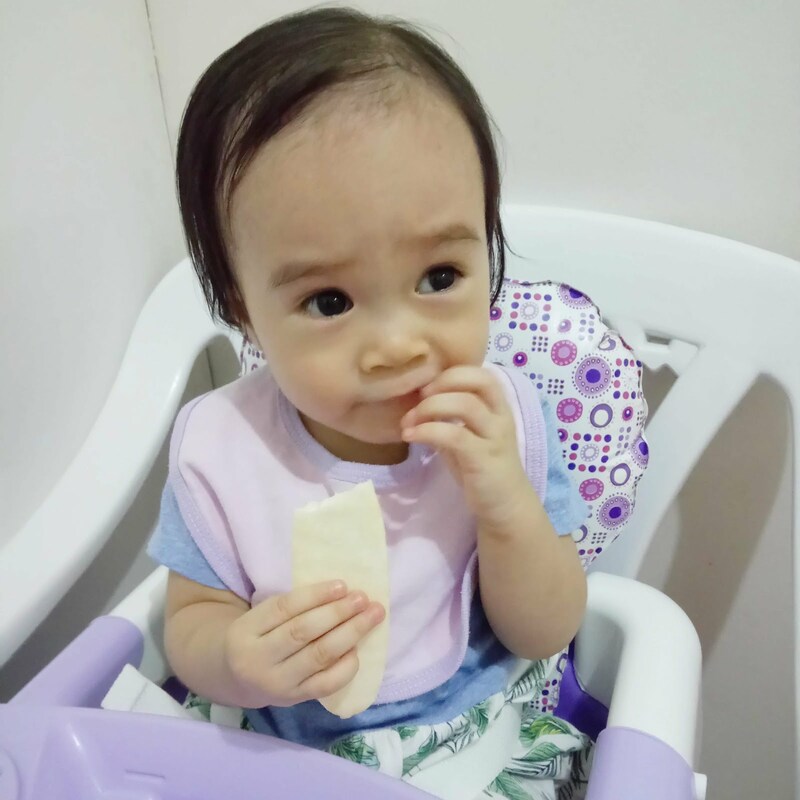 I know a lot of mothers who are "healthy food nazis," to the point of shaming other moms when we opt to feed our baby with what they consider as junk food. (Believe me, I've had my share.) But not all packaged baby food are harmful nor unhealthy. If you know where to look and if you do your research, you'll find perfectly healthy and safe commercial baby food such as Nosh Baby Munchables! 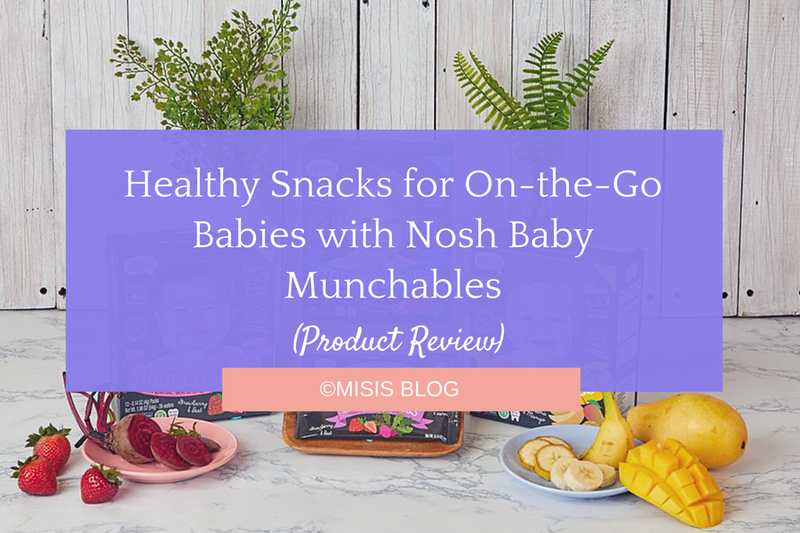 Nosh Baby Munchables is an organic teething wafer that comes in a variety of flavors. 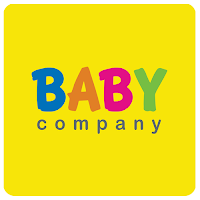 In the Philippines, and particularly at Baby Company at SM Seaside Cebu, the flavors available are Strawberry and Beet, Blueberry and Pomegranate, Banana and Mango, and Apple and Cinnamon. All of Nosh's baby food products are SDA Organic Certified and Non-GMO. The wafers are baked instead of fried, and are made without artificial colors and flavoring. Since we have a family history of allergies (me in particular), it makes me feel safe that the wafers are free of 8 common allergens. No teeth? No problem! The wafers dissolve easily, so there's not a lot of sticky mess. Since my baby already has some teeth (4 and 3 more coming! ), the wafers help in massaging the rest of her toothless gums as she munches on them. The wafers are nicely sized for little hands, but it does tend to break off easily. (My daughter enjoyed breaking them, by the way.) The good thing about this is that grabbing the little pieces becomes a great motor skill training activity for babies and toddlers, so it's still a win. The wafers come individually sealed in packets of two, so it stays fresh even when my daughter isn't able to finish the whole pack. It's also handy and fits easily into any bag, though you might want to handle it with caution, as it easily breaks. She loves it! 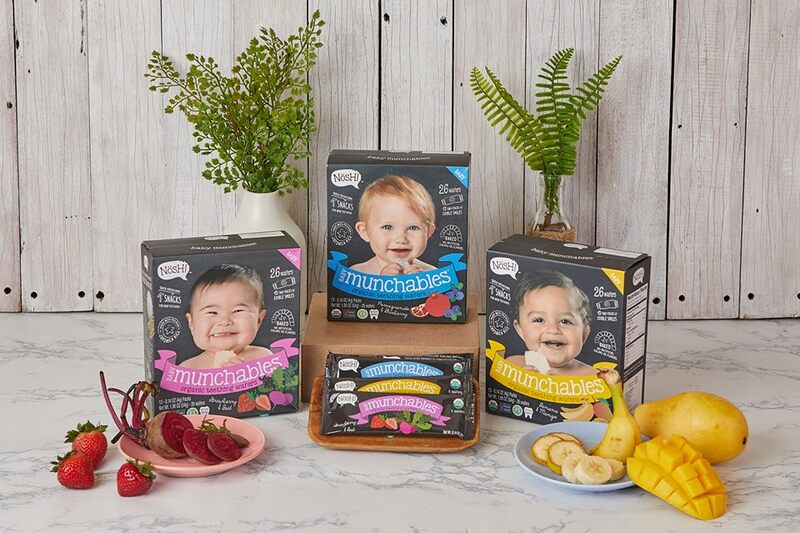 Seems like we're going to need more Nosh Baby Munchables in the future. 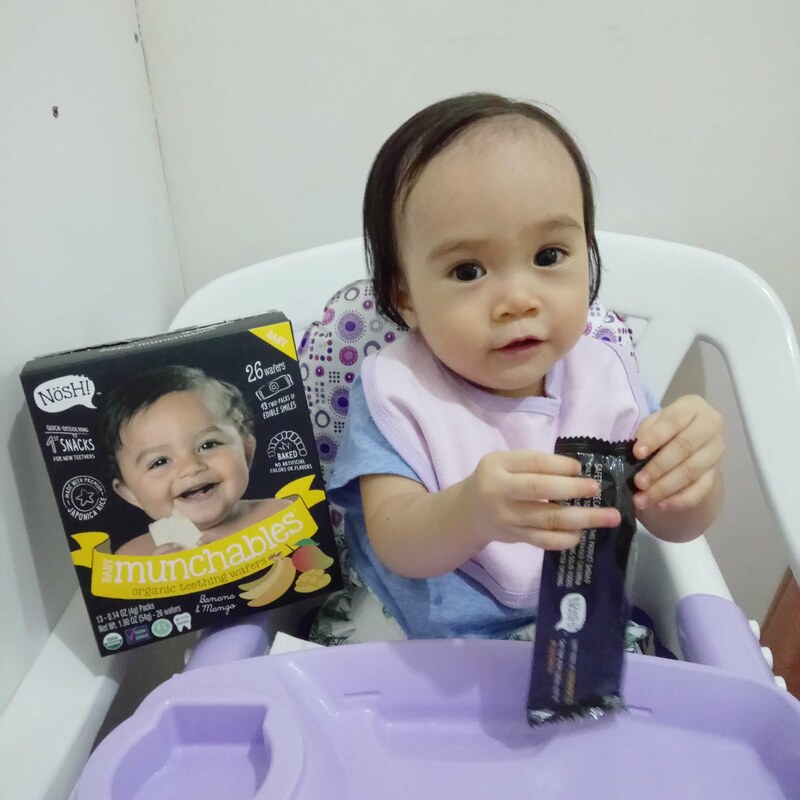 Nosh Baby Munchables are offered at P195 per box, and each box contains 26 pieces—a great deal at an affordable price! 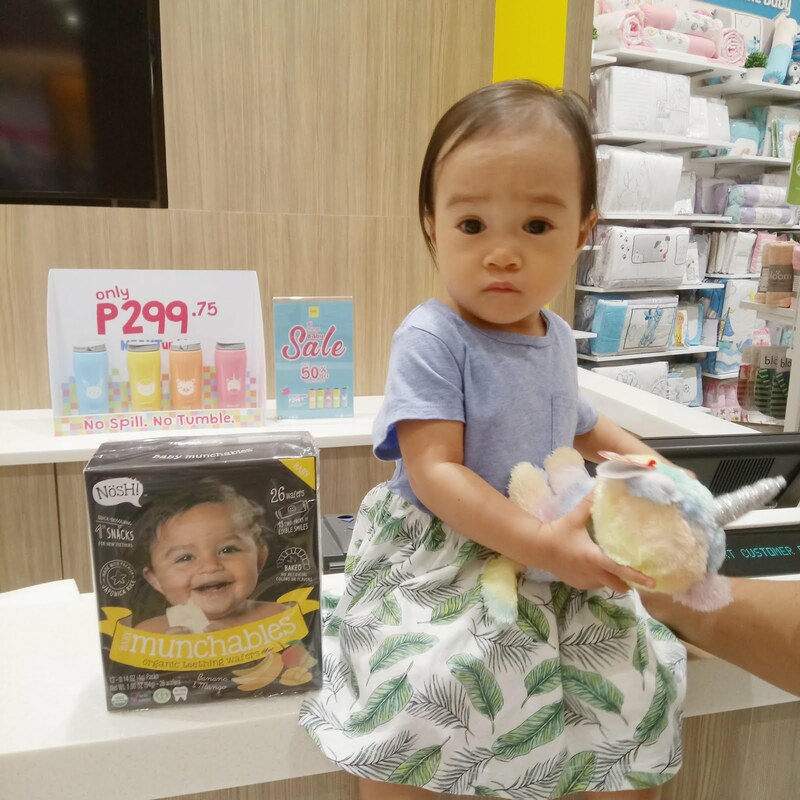 If you'd like to give it a try, head on to your nearest SM Mall or Baby Company Boutique.